Anyone who intends to enter the fray of competitive Donkey Kong—whether as a player or a spectator—will get a lot more out of it once they understand the concept of pace. Defined most simply, pace is an estimate of the player's final score upon reaching the kill screen. Pace is a function of how many points the player is extracting from each board, which will vary depending on how efficiently and aggressively the player completes them. 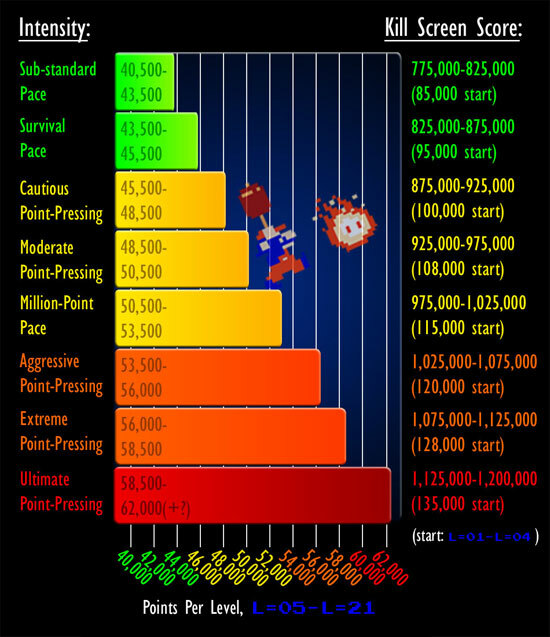 The "base units" of pace are the start score and the average score per level thereafter. This was a psychological ploy, an adjustment to the original Japanese version (which simply cycled the boards in the straightforward 1-2-3-4 order from Level 1 on) when the release team at Nintendo of America got their hands on the game: keep the player guessing, and the quarters flowing, by switching up the board order until bringing the player to a point in the game—the dreaded third elevator board—that was designed specifically to stop them in their tracks. Beginning at Level 5, the game reaches a plateau in its internal difficulty setting, which controls factors such as the number of points available on the bonus timer, the speed and quantity of obstacles, and the character of "wild" barrels. It remains at that plateau all the way through Level 21. In theory, therefore, Level 5 plays the same as Level 8, which plays the same as Level 18, which plays the same as Level 21. In practice, however, one level might be more difficult or less difficult than the previous level. That's because the behavior of obstacles is controlled by a random number generator with a mind of its own. Anything can happen at any time. 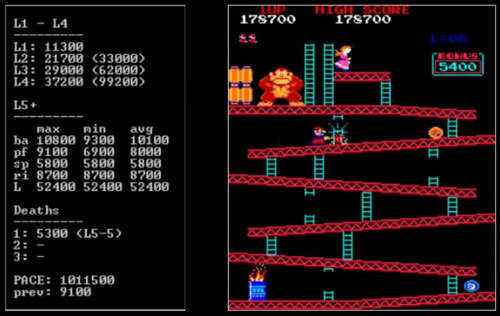 This underlying randomness is the secret to Donkey Kong's depth and mystery, and why it requires so much skill to play—you never get the same board, the same level, or the same game, twice. Anyone who would disparage Donkey Kong players as a bunch of pattern-regurgitating automatons frankly doesn't know what they're talking about: overarching approaches and "best practices" can be developed and employed, but ultimately every moment requires the player to think on their feet, because the obstacles are random. The only constant is the laws governing that randomness, which normalize starting at Level 5. The idea here, in terms of Nintendo of America's machinations, was to kill any player who managed to get past the elevators on Level 4 with an avalanche of barrels, which was believed to be the deadliest of the board-types. 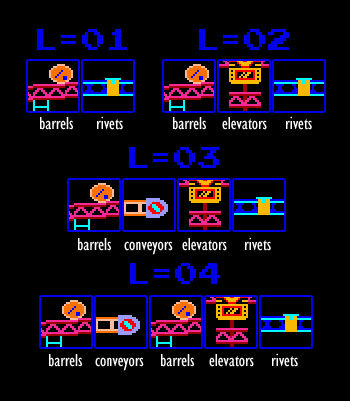 Once past the L=1-L=4 start, the player will face a total of 51 barrel boards, and 17 each of the other types. Upon reaching the first board of Level 22 (#117), the game code runs into an accidental programming oversight. An internal timer-calculation counter "overflows" (in a manner similar to the Y2K bug), the program malfunctions, and the player dies seven seconds later, long before he can possibly complete the board. This moment is the infamous "kill screen." There is no way around it; the game ends here. Since the game becomes uniform at Level 5, if a player approaches each board-type in a consistent manner, his score per level will tend to be roughly similar. The benefit here is that we can use a player's per-level average to describe not only how he is doing, but as a predictive means of extrapolating what his final score will be upon reaching the kill screen. Because Levels 1 through 4 are inconsistent with the rest of the game, there is no predictive value in dealing with them individually, which is why we lump them all together as a single start score. The start is like the "opening" in a chess game—nothing major has happened, the players have merely put their pieces into position for the middle game. Calculating pace is simple—add the player's total start score to 17 times the average number of points earned in each level thereafter. If the player loses one or more lives before completing a board, but then goes on to complete it on a susequent life, only the points earned on the successful run are counted (otherwise that board's score, and thus the average, would be artificially inflated). The player should earn at least a few thousand points for each death, with the ideal being to reach the final barrel board of Level 21 (#115) with one or more spare men to sacrifice by racking up an extra 10-14,000 points before the timer expires. This is known as a "cash-in." 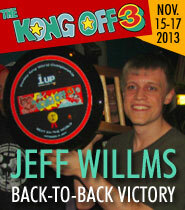 Donkey Kong master Jeff Willms (whose brainpower we're all a little bit afraid of) has created a program called "Pauline" which works alongside MAME and uses screen-scraping and optical recognition algorithms to automatically detect the current score and board number to calculate the player's pace. A kill screen score of between (roughly) 800,000 and 850,000 points can be achieved simply by completing all 117 boards. A score between 850,000 and the theoretical maximum of 1,200,000, however, can only be achieved by pushing harder (ie, increasing the points achieved per board). Because the player will eventually hit the brick wall of the kill screen (assuming that he survives to that point), he cannot possibly achieve a score higher than 850,000 or so unless he increases his scoring pace. This is where point-pressing comes in, and indeed why point pressing is necessary at all! 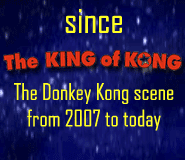 If it weren't for the kill screen, competitive Donkey Kong would be a whole different ball game, and (in the estimation of many players) a less interesting one. You could simply play on and on until you lost all your men, taking minimal risk. The point-presser's task is to set a kill-screen goal score, determine the necessary per-level average that will produce that score, and then play through the game at that pace. As you can see, the big jump in score between survival and million-point pace is on the barrel boards, while the other board-types only moved up modestly. Going into the specifics of how points are earned on each board would be an article of its own, but suffice it to say that the barrel boards are where most of the points are harvested, and where most of the risk must be engaged. In the interest of making all of this somewhat easier to understand, I have broken the per-level averages upon which pace is calculated into 8 separate tiers of point-pressing intensity. While some might nitpick my cutoff-points (and my silly tier-names), If nothing else, referring to this chart should help you to better understand, appreciate, and follow along with a Donkey Kong game in progress, and to get an idea of the final score a player might expect. Recently Hank Chien, knowing that I was working on an article about pace, told me about how he often hears people say "I got 300,000 and I wasn't even point pressing." This is like saying that you got five miles into a marathon and you were only walking. You get points in Donkey Kong by jumping, dodging, or smashing things, and then adding those points to whatever is left on the bonus timer upon clearing the board. Therefore, improving one's per-board averages, and thus, one's pace, is a matter of jumping, dodging, or smashing more things, while maximizing the bonus timer. The salient fact here is that everything you're jumping, dodging, or smashing will kill you if you touch it! It should make intuitive sense, then, that anything you do to get more points also increases your chances of dying. In other words, the more points you try to squeeze out of the game, the harder it is to get through the game. In fact, your average per-game final score will be higher when you don't point press. That's because you're making it easier to clear more boards and absorb more bonus timers, avoiding the bad luck and difficulty that come with point-pressing... but in runs that have no shot whatsoever at ending up at the kill screen with a seven-figure score. That style is fine, maybe even better, for any player who isn't yet good enough to reach a basic kill screen (or who, like me, just enjoys walking through the game for its own sake), but if you want to play among the elite, you have to hustle. Compounding the challenge is that point-pressing is also time-consuming, placing an even greater requirement on mental and physical endurance than the player is already undertaking by assuming the higher degree of risk that it demands. A basic 850,000-point pace kill screen game (which, let's be clear, is not at all "basic" until you've amassed enough skill to do it) takes a little over an hour and a half to complete. Dean Saglio's 1.2 million-point MAME world record was twice as long—a brutal, three-hour grind of stamina and concentration. So when you point-press to increase your scoring pace, you don't just make the game harder. You also make it longer. It's one thing to juggle four tennis balls; quite another to juggle six flaming machetes. The scores are identical, but there's a major difference here. If I've made sense so far, you should understand what that difference is. The player in game 1 has "gone deeper," but he's just getting by, while the player in game 2 is on a phenomenal, world record-breaking pace. A score, by itself, leaves a lot unsaid. Pair it with the level, however, and we can say exactly how ambitious a game was, and get a much better idea of the skill level of the player. A player who just wants to reach the kill screen doesn't need to think about pace at all. His 825-875,000 points will take care of themselves as an automatic consequence of survival. The player going for a million, however, doesn't have this luxury. He has to completely reformulate his gameplay. He must spend another (cumulative) hour on the barrel boards, keep a constant eye on his bonus timers, find ways of making up for lost points, and take chance after chance that he'd rather not. 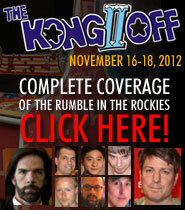 Between 1 million and 1.1 million, precision, aggression, and risk must be ramped up considerably. Many players hit the wall in this range, reaching the limit of their mental and physical capacity. Finally there is the last 100,000 points between 1.1 and 1.2—the realm of the world record—which is obscenely difficult to survive within. A player can't afford to leave any points unclaimed on the way to the kill screen. Every single board is a fight for inches, requiring uncompromising aggression, and even imagination. When targeting a score like that, a player will be forced to ditch and restart countless games, in fact most of his games, since so many will, through no fault of his own, lapse into insurmountable "pace deficits." There is a reason why far more players have achieved a low million than a 1.1, and why only one individual in the history of the game has ever cracked 1.2. Each additional 10,000 point increase along that final 100,000 point corridor escalates the demand on a player by another order of magnitude. The 50,000 points between 900,000 and 950,000 pales in comparison to the 50,000 points between 1,150,000 and 1,200,000. Consider how eking out (or missing out on) just 200 points per barrel board, a mere 600 per level, will add up to over 11,000 points over the course of a game. 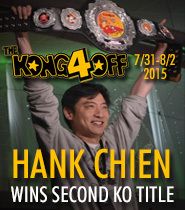 The gaps between all four of Hank Chien's most recent world records (1,090,400, 1,110,100, 1,127,700, and 1,138,600) are in that range. 11,000 points can, and does, span multiple spots within the top 20 on the all-time scoreboard. In the elite tier of Donkey Kong play, finding that elusive 5 or 600 points per level matters. In fact, that's what the whole fight ultimately comes down to: exploiting the small things, and magnifying them through repetition as the game cycles through the levels. A marathon is 26 miles, whether you're jogging casually or running at top speed. Needless to say, the person who gets to the finish line first will have trained, pushed, and suffered to a much greater degree than the one who comes in last, and will have found an edge somewhere, even a tiny one, over the second-place finisher. It will have been hard work for all three, but pace is what made the winner a champion. Thanks for this article, it's articulate and well-written, and provides a fascinating window into the world of competitive play for this game. Well done. I really appriciated your work here, fantastic article. Cheers! ELEVATOR 5 OR 6 WAS THE BIGGEST CHALLENGE, BUT I WAS ABLE TO HOLD ON...THEN BARRELS (FLYING ALL OVER THE PLACE ) GOT ME...THERE IS ONLY A WAY OF MASTERING KONG :A JOY STICK, COMPUTER CONTROLS DONT DO A GOOD JOB.